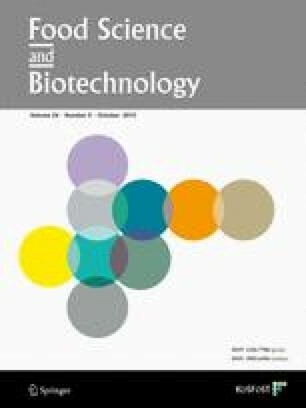 High value-added food materials were developed based on enhancement of phenolic contents in Cudrania tricuspidata leaves using fermentation of silkworm thorn leaves with Lactobacillus derived from Korean soybean paste. Ethanol extracts from fermentates were examined for antioxidant activities and flavonoid and corresponding glycoside contents. Radical scavenging activities were increased by approximately 20% after fermentation. Two prominent spectral peaks in fermentates that increased in size, compared with non-fermentates, were identified as quercetin (m/z 301.1) and kaempferol (m/z 285.3). Three peaks that decreased in size in fermentates were identified as quercetin-7-O-beta-glucopyranoside (m/z 463.1), kaempferol-3-O-beta-glucopyranoside (m/z 447.1), and kaempferol-7-O-beta-glucopyranoside (m/z 447.2). Conversion of flavonoid glycosides to flavonols, quercetin and kaempferol, occurred in silkworm thorn leaves due to fermentation with Lactobacillus.